Today I’d like to pay tribute to the egg. Often overlooked and previously maligned, it has overcome its humble beginnings and surpassed its bad reputation to earn a place in the food spotlight. Eggs are a perfect food for anytime of day. They play well with others and are ready for anything, whether it be French, Mexican, Mediterranean, Spanish, American or any other flavor combination you are in the mood for. Need some ideas? How about a prosciutto and arugula breakfast sandwich, or an English muffin egg sandwich, or maybe Oeufs en Cocotte, or a puff pastry breakfast tart, or simply the most perfect scrambled eggs. Today I bring you the Tortilla Egg Bake. A sumptuous little dish that could be made any time of day, really. It combines peppers, onions, eggs and cheese in a tortilla shell that is baked in the oven until perfectly set. The recipe is basic, but you can add any other vegetables to the mix that you have on hand – tomatoes, zucchini, roasted potatoes are just a few suggestions. Simply add them in with the pepper and onion sauté. Feel like a little ham or bacon? That can go in, too. As for the cheese, just pick your favorite. You can make just one or ten at a time – your choice. Let’s give those eggs a round of applause ’cause they deserve it. Preheat oven to 400 degrees. Lightly spray two 8 ounce ramekins with cooking spray. Press a tortilla into each ramekin. Coat a medium sauté pan with cooking spray and heat over medium heat. Add onion and pepper and cook, stirring occasionally, until vegetables are soft, about 3 to 5 minutes. Remove from heat and set aside. In a medium bowl whisk together eggs, salt and pepper until well combined. 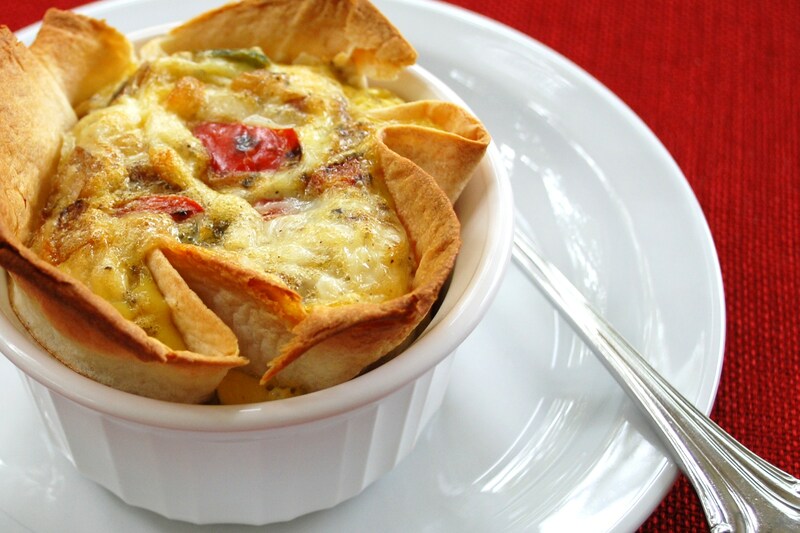 Stir in cooked vegetables and cheese and pour mixture equally into ramekins. Bake about 20 minutes until center is set and a knife inserted into center comes out clean. Let sit about 5 minutes before serving. This looks wonderful! I’m going to make them RIGHT now for the kids for breakfast. thanks for sharing.